Career chats, presented by Ballinamore CS Parents Association was a great success again this year. A number of expert speakers imparted wisdom to senior students about their chosen career path. Leitrims Health is Wealth event to promote positive health and wellbeing takes place in The Bush Hotel in Carrick on Shannon at 7pm on May 3rd. Community School Parents Association regular bimonthly meeting will take place in the school this Tuesday 4th April at 8pm. A meeting of the Ballinamore CS Parent’s Association will take place on Tuesday 7th February 2017. All welcome. Transition Year’s undertook a variety of activities around the area of world hunger and food poverty for their DE Module. They participated in a CONCERN workshop on the area of World Hunger and learnt more about how people in developing countries are affected by lack of food. Another activity they undertook was the St Vincent De Paul Christmas Food Appeal where various food boxes were donated in school and helped those in need on the lead up to Christmas. This was part of their work during Social Awareness Week. The final activity students took part in was the Concern Fast prior to Christmas (along with some of the Junior students) where the total amount raised for Concern was €857.66 . Well done to all the students in school who participated in the fast and helped raise a fantastic amount for Concern. As a result of their effort and work in this area they were each awarded a Hunger Heroes Certificate from Concern in recognition of their commitment to understanding more about this topic. Fair-trade is an alternative approach to conventional trade and is based on a partnership between some of the most disadvantaged farmers and workers in the developing world and the people who buy their products. Fair-trade offers us a powerful way to reduce poverty through our everyday shopping. Fair-trade Fortnight was held this year from 23rd February-8th March. Students learnt all about fair-trade and its importance through the DE programme in school. 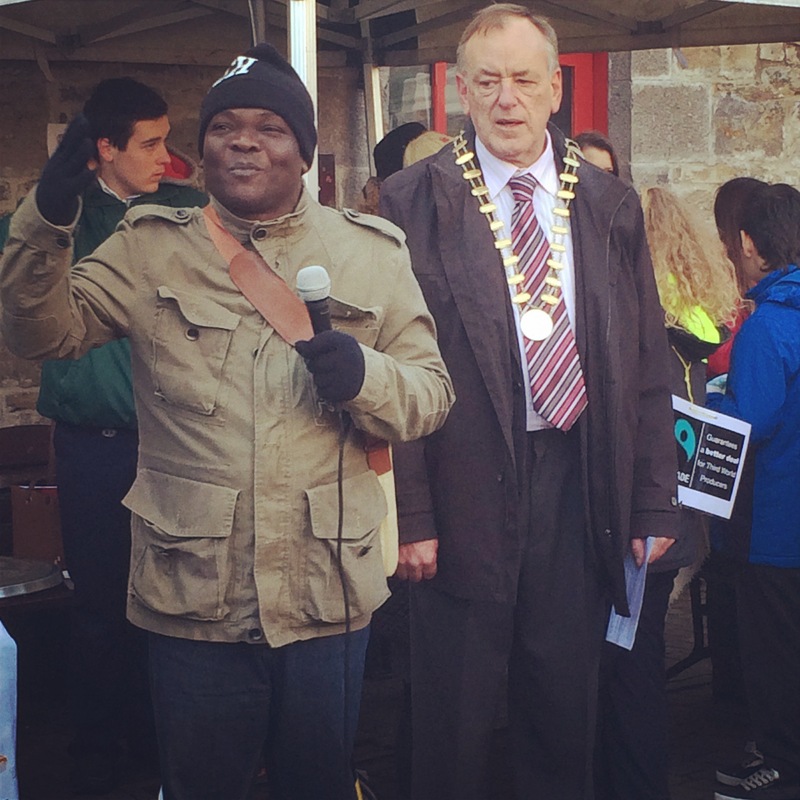 The Transition Year students then got involved in an organised event during Fair-trade Fortnight by participating in a fair-trade parade in our nearest designated Fair-trade town (Carrick on Shannon). Students got the opportunity to meet and hear Chief Adam Tempuri (a cashew nut farmer from Ghana) speak about the difference we make to his families life by supporting fair-trade. After the event students visited the local farmers market which runs every Thursday in Carrick. They visited the various stalls to see what local farmers and producers has to offer and enjoyed sampling some of these delights.